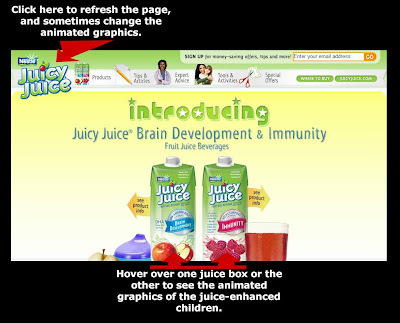 I've seen commercials lately for Juice that is formulated to enhance brain growth or immune systems in children. As a parent of two children, I understand that people want the best for their little ones, and are especially vulnerable to the suggestions of others when their kids are very young. I had my doubts about the science behind these juices, so I went to the web site dedicated to them. I found nothing conclusive there, but I did find out why people might need super juice for their youngsters. 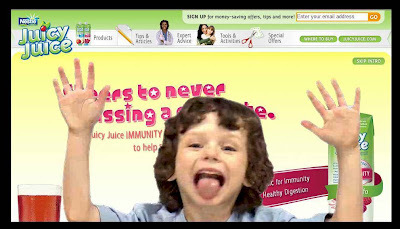 It's because these days kids will lick anything, including a stranger's computer screen from the inside. Who knew? What you see above is part of an animation, one that I found kind of odd to say the least. When I find things odd, I like to share them. So here we are. If you would like to see the animation yourself, I encourage you to go to the web site too. I am not going to link to it, though, because I am afraid of multinational corporations. You'll just have to find it yourself. Some instructions for getting animations to load are found below. If you decide to do a search for this particular screensaver and download it be sure to do a virus scan. Better yet, just watch the vid and not download it at all. If you like pugs, you'll likely be hooked.